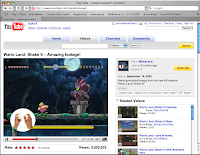 Check out this YouTube page which gives the viewer a tutorial on the Wii’s Wario Land: Shake it! Without giving too much away, the viewer interaction of this video is very original and got me hook, line and sinker. It’s in the vain of HEMA’s website and I expect this technique of guerilla website design will take many forms in the near future.